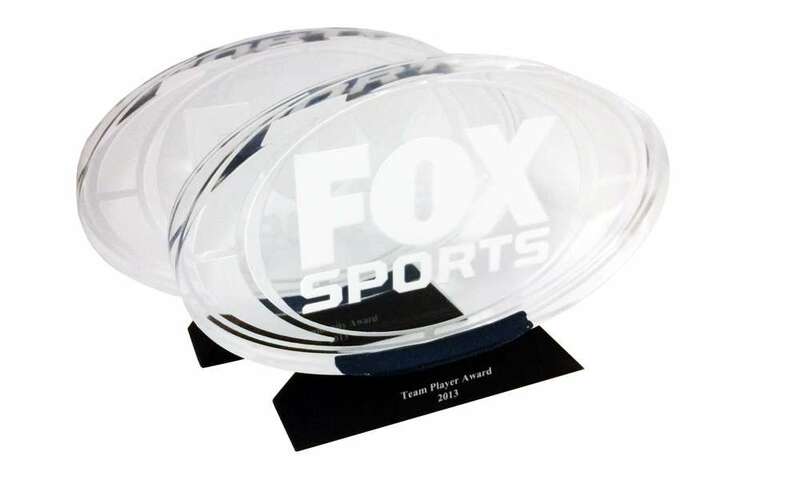 Crystal teamwork award presented by the National Football League. 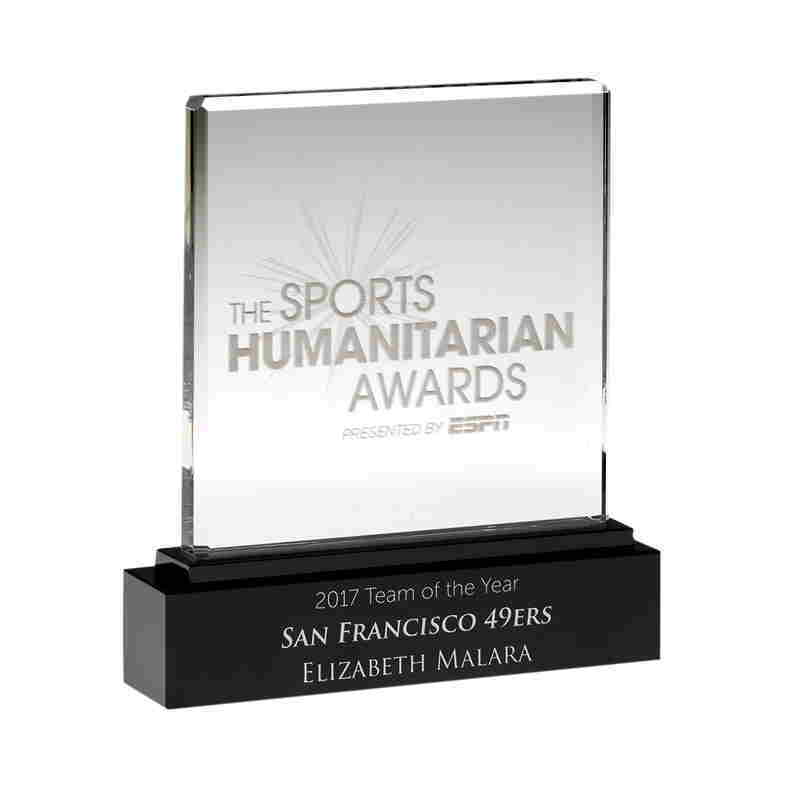 ESPN's Sports Humanitarian Awards annually honor athletes, teams, leagues and corporations. 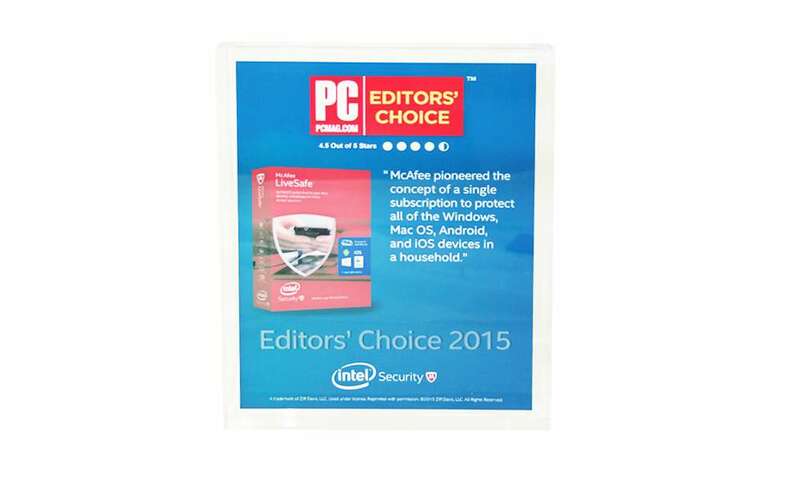 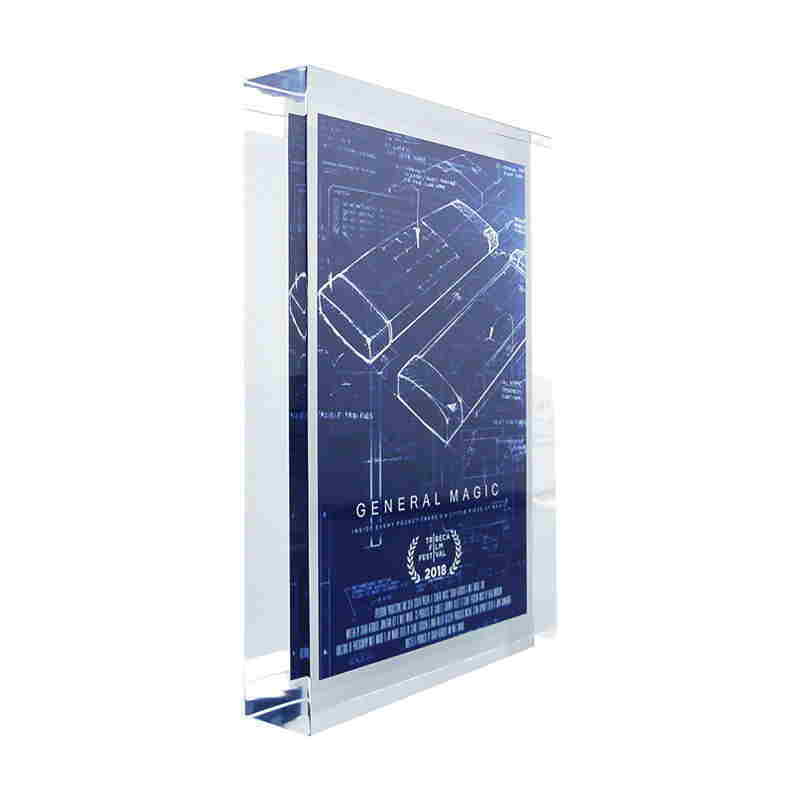 The award is in its fourth year. 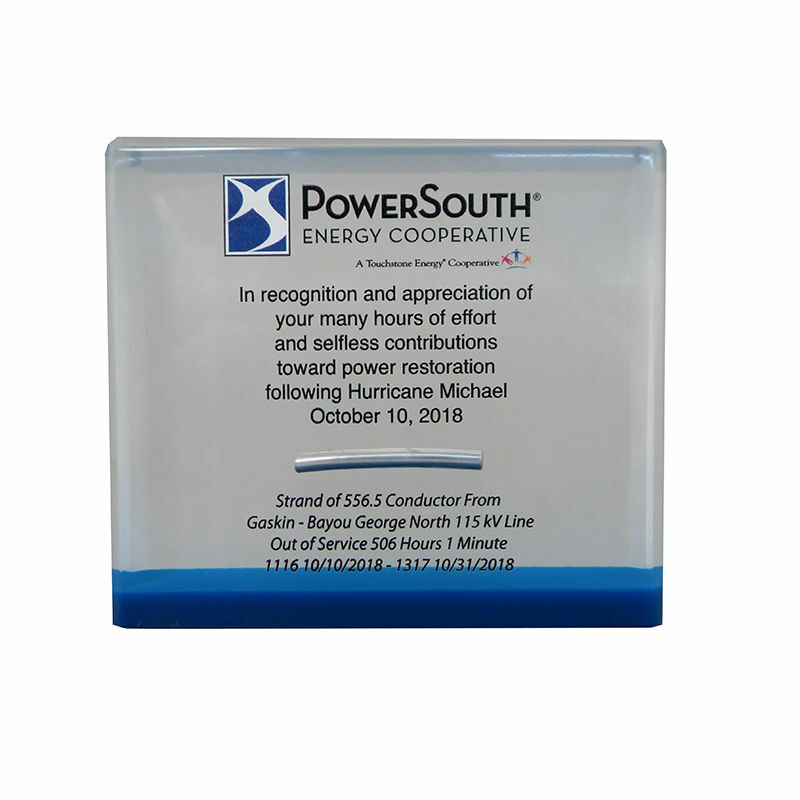 Custom crystal team recognition award presented by PepsiCo. 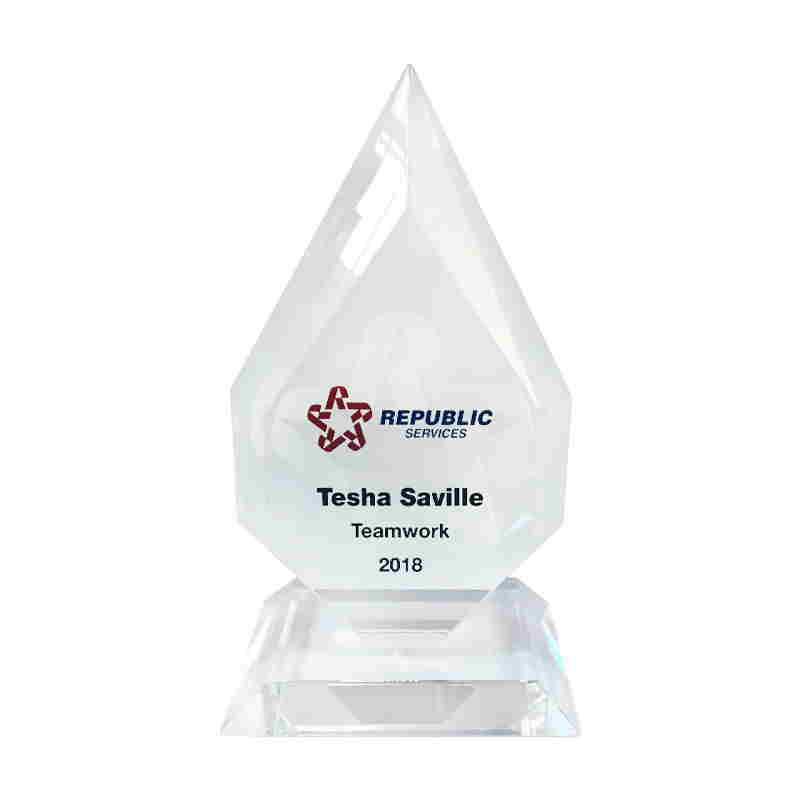 Crystal teamwork award presented by Phoenix, Arizona-based Republic Services, a national waste collection and recycling firm. 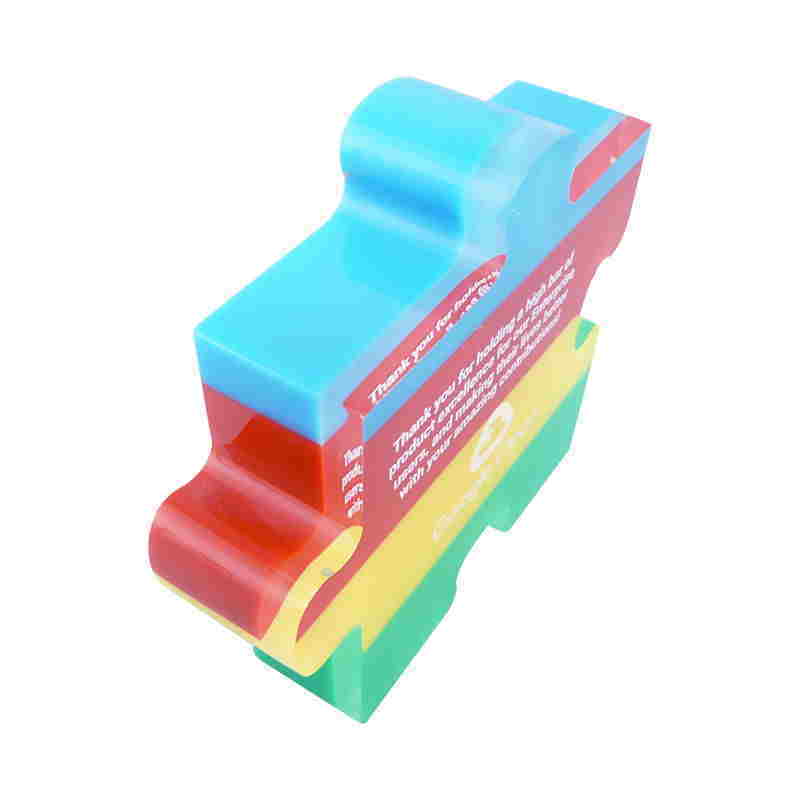 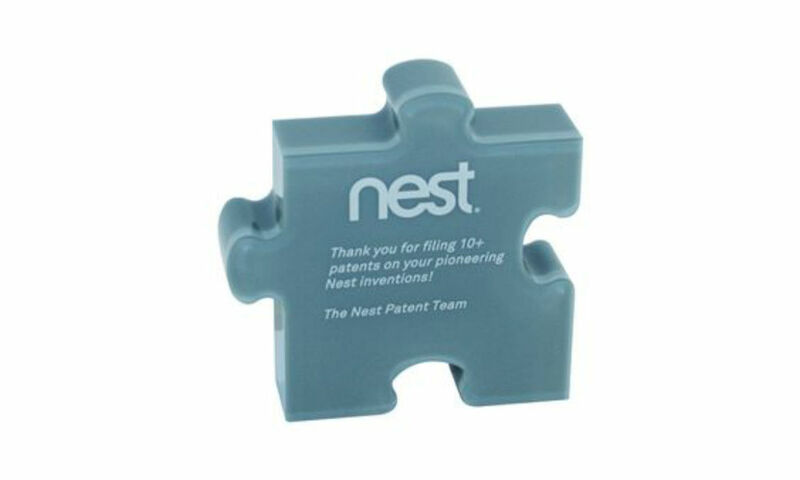 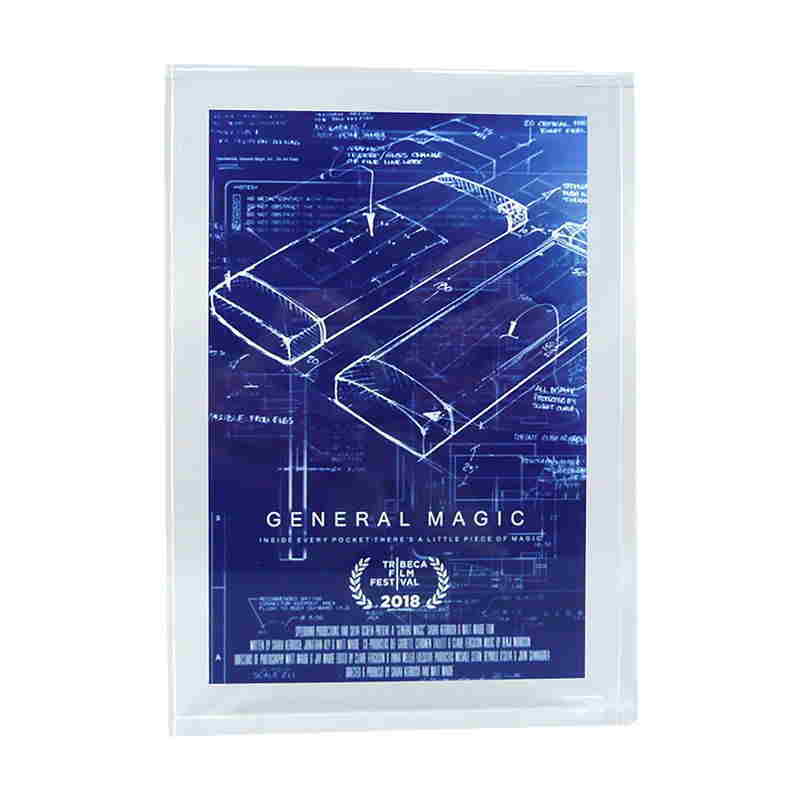 Puzzle-themed custom acrylic award celebrating the filing of a 10th patent by a Nest employee. 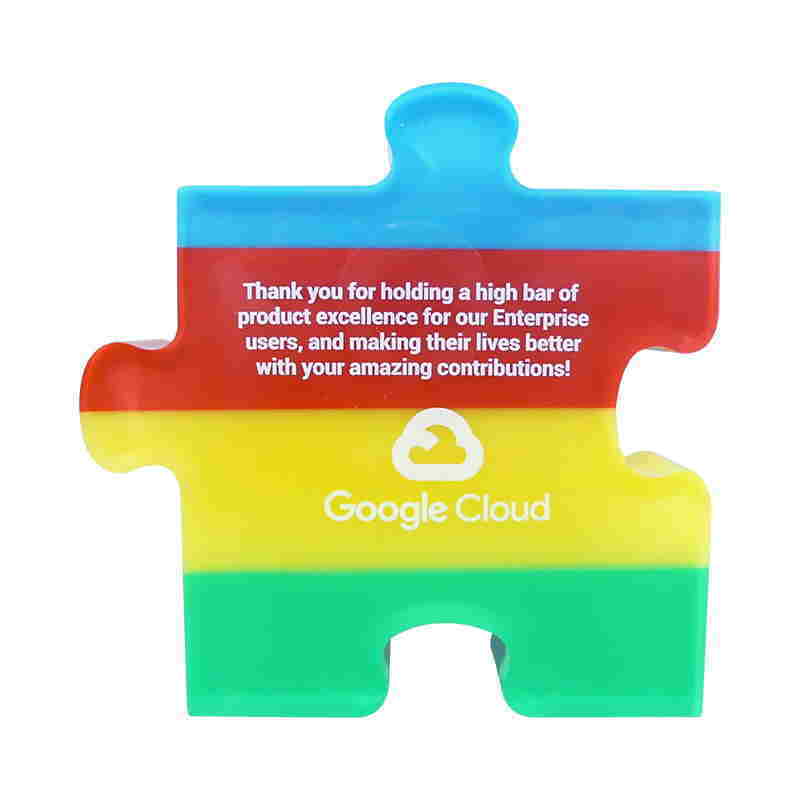 A subsidiary of Google, Nest provides smart home technology. 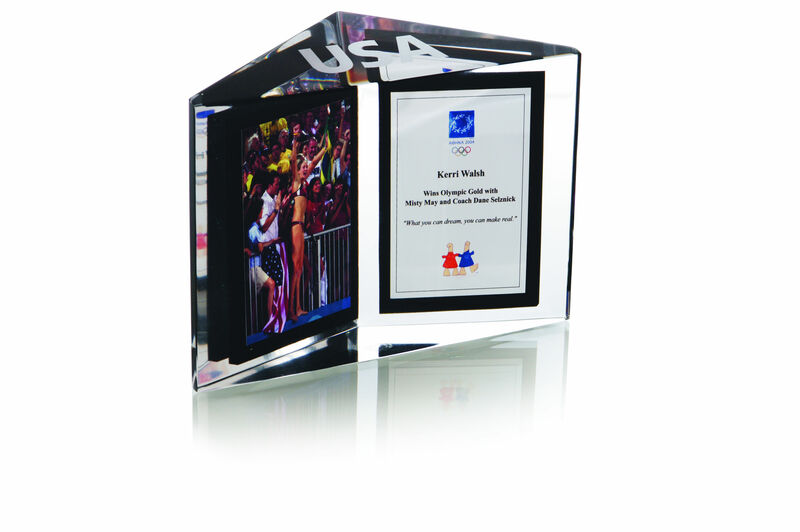 Custom acrylic award honoring the Olympic Gold Medal performance of beach volleyball players Kerri Walsh (Jennings) and Misty May-Trainor, and their coach Dane Selznick. 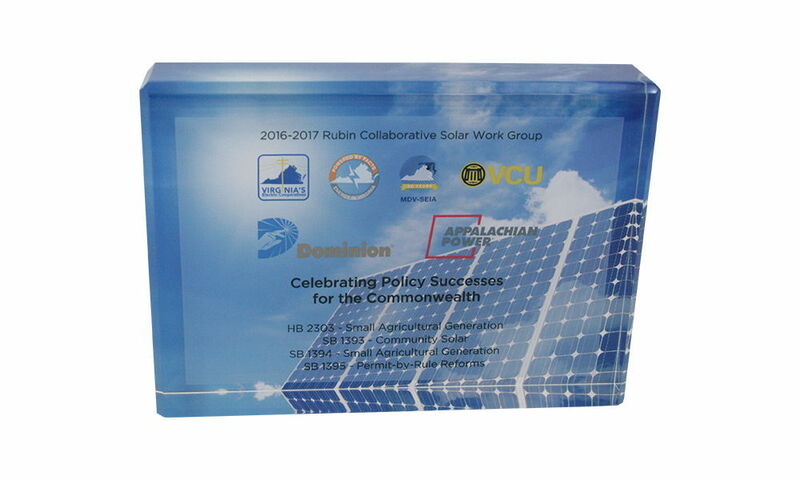 Custom acrylic award recognizing members of the Rubin Group, which was formed to explore legislation to advance solar energy in Virginia. 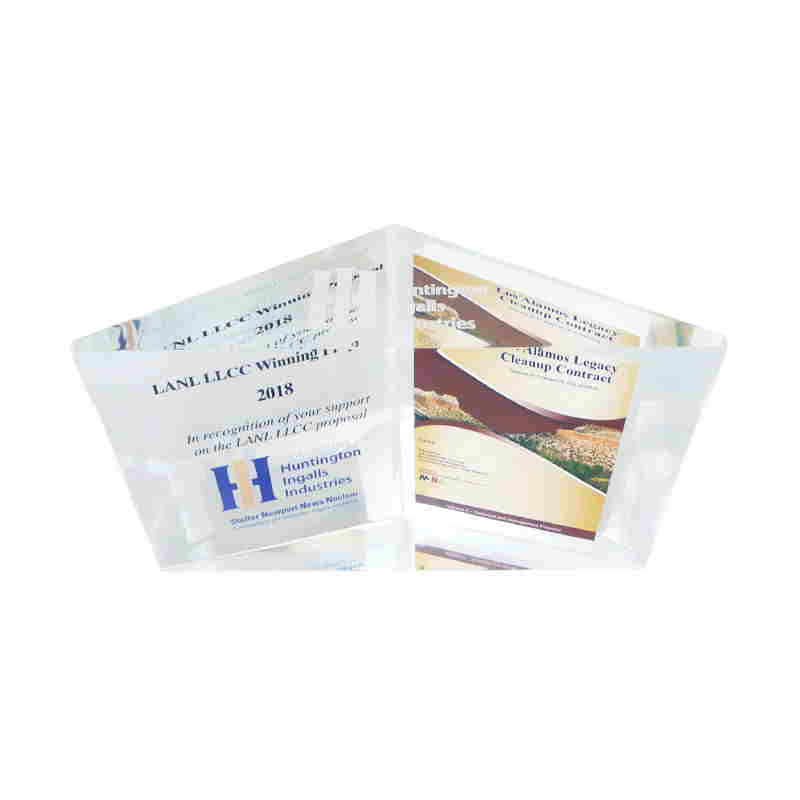 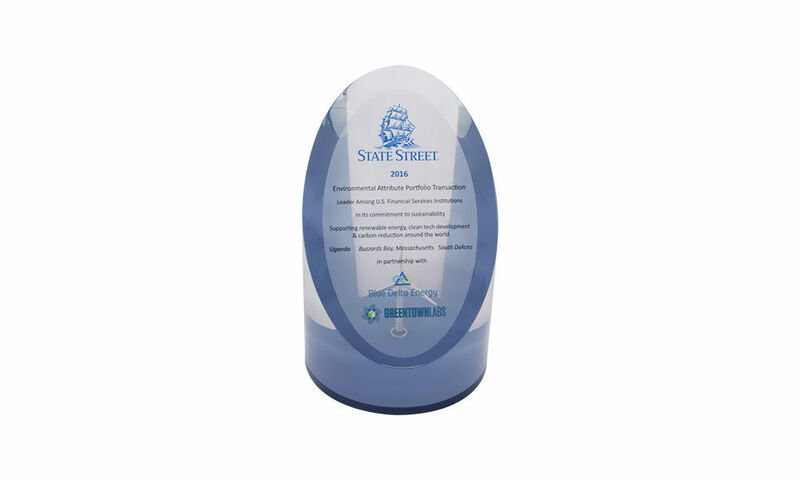 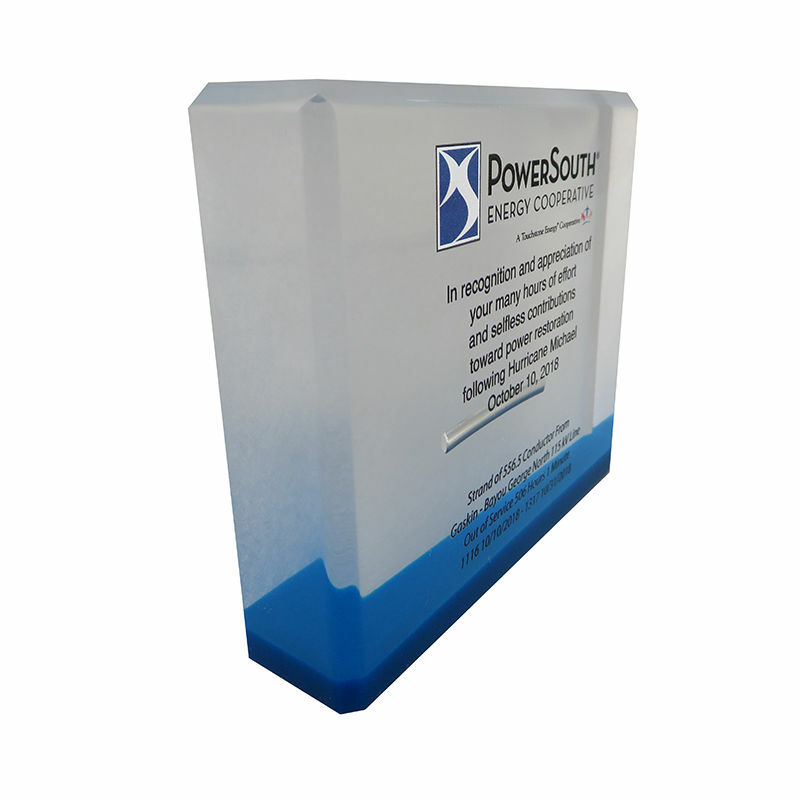 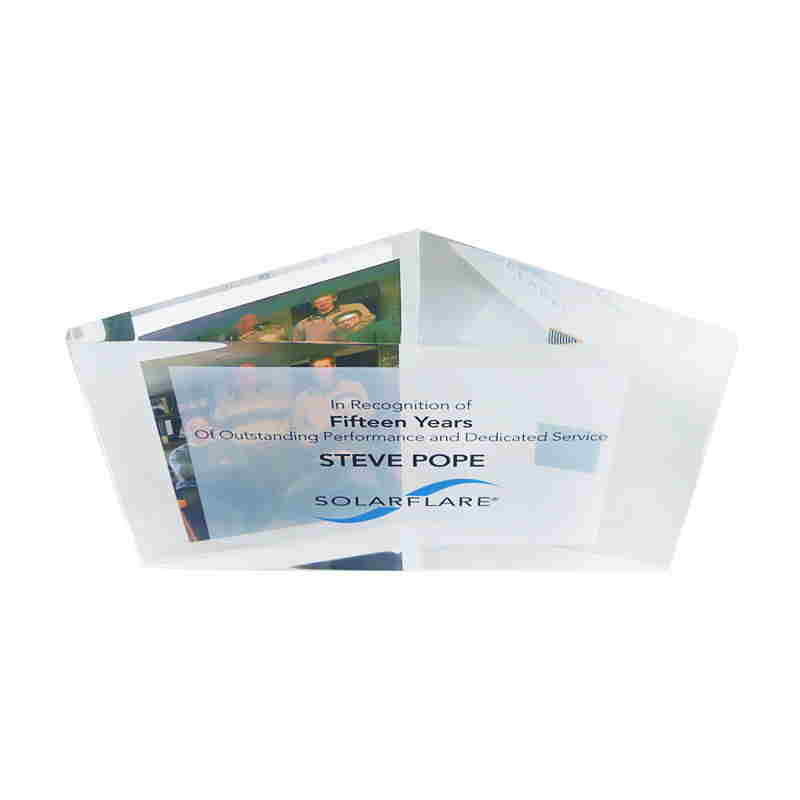 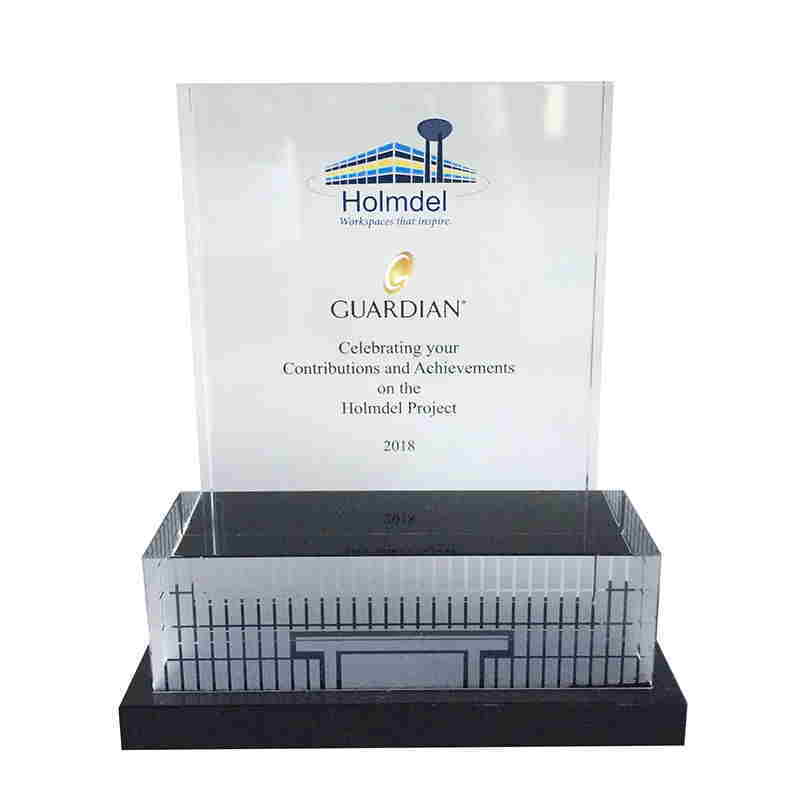 Custom acrylic award honoring corporate sustainability efforts. 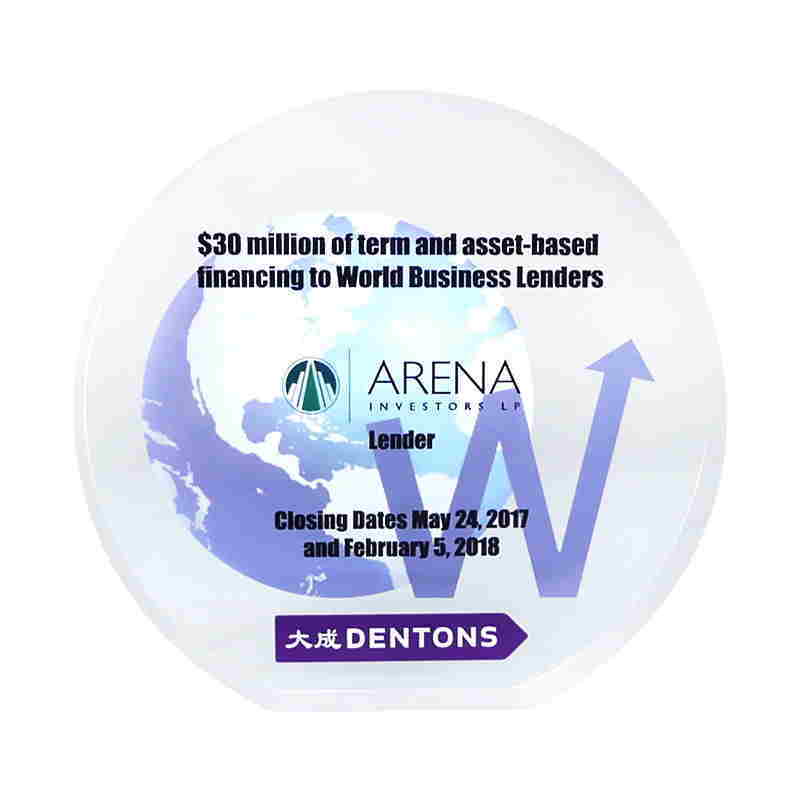 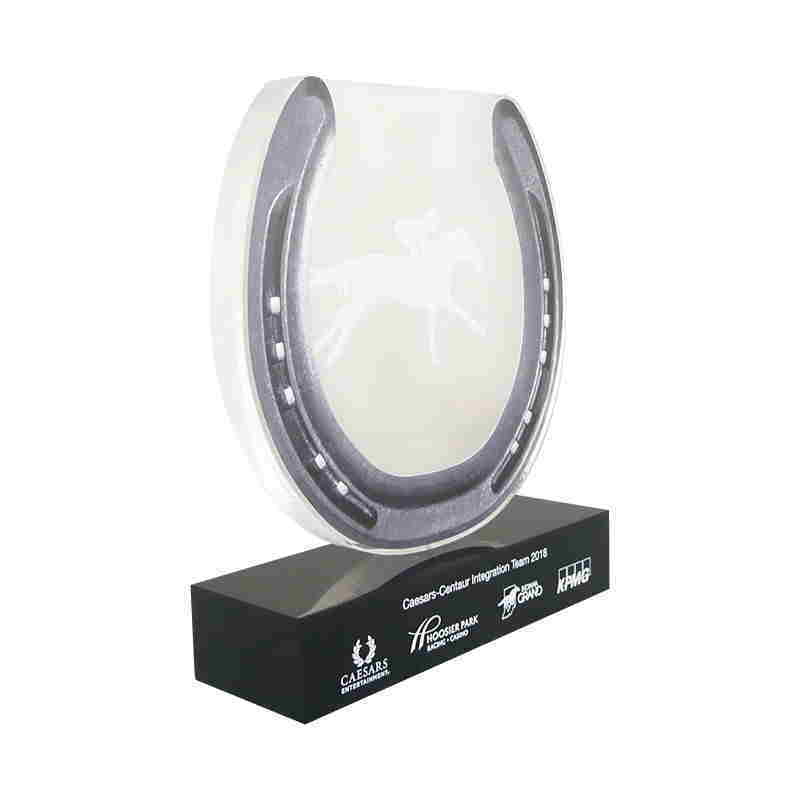 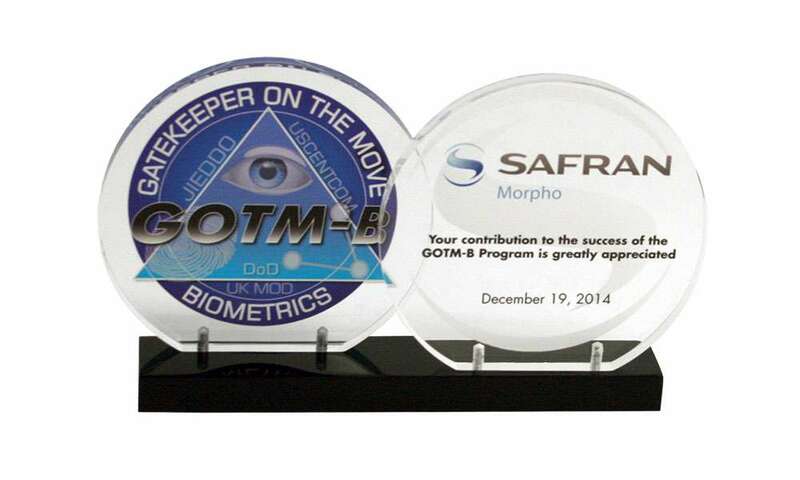 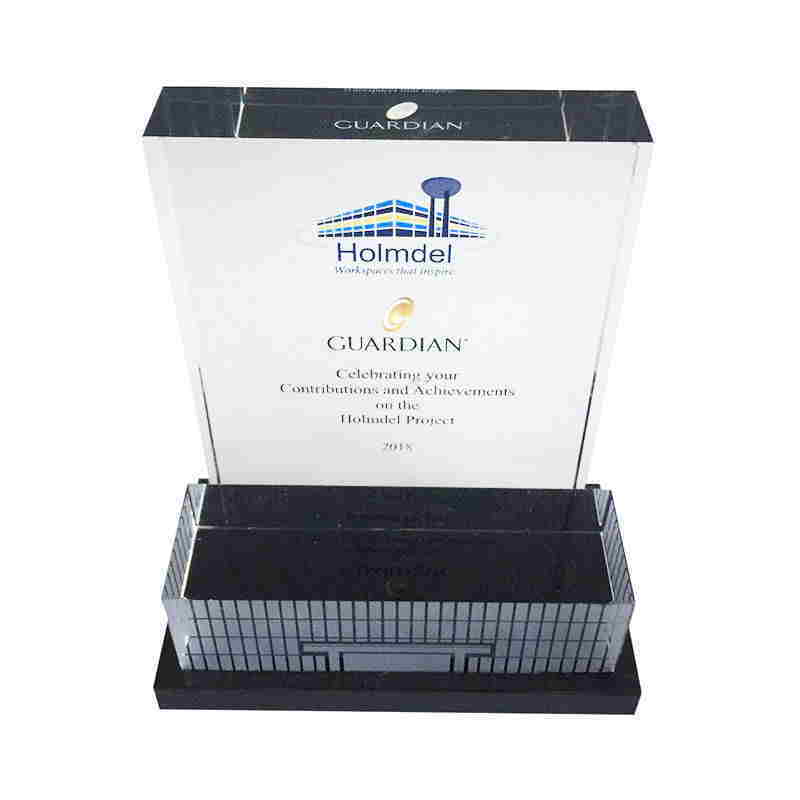 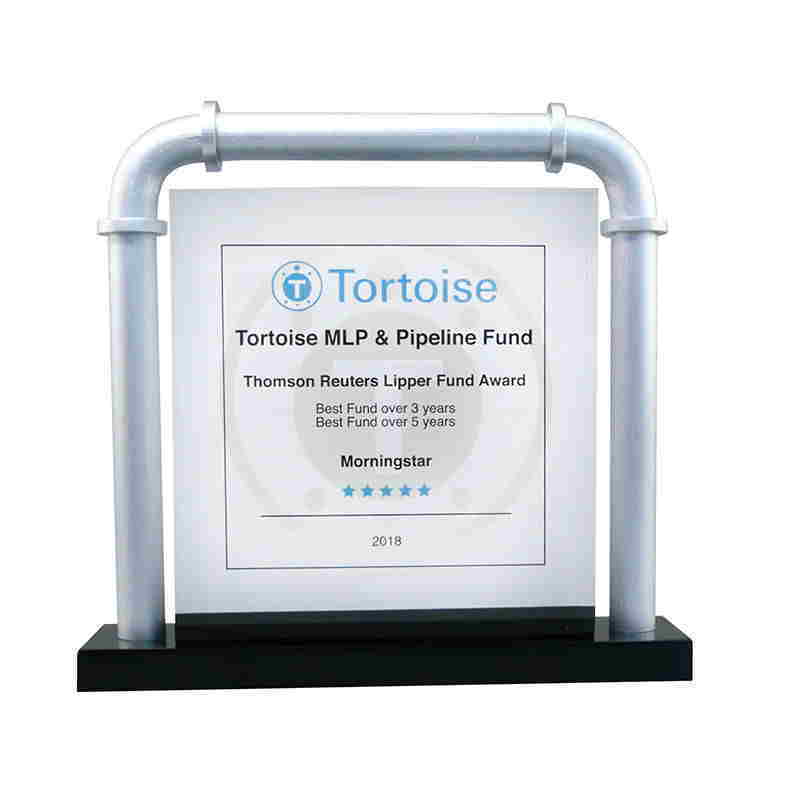 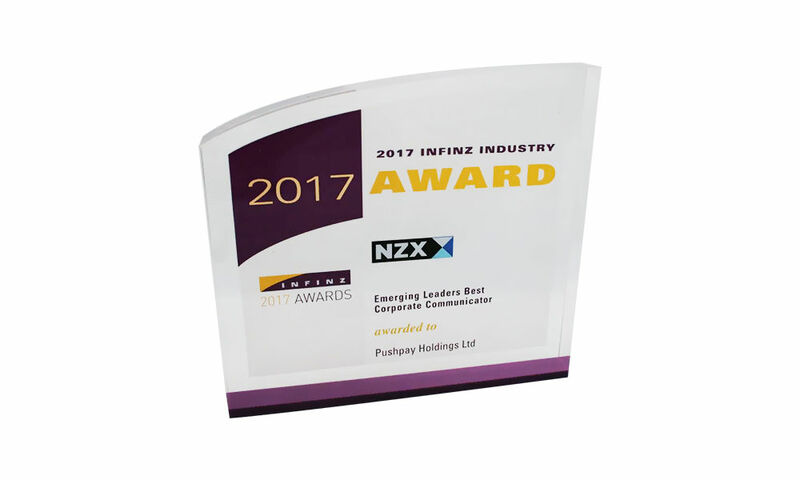 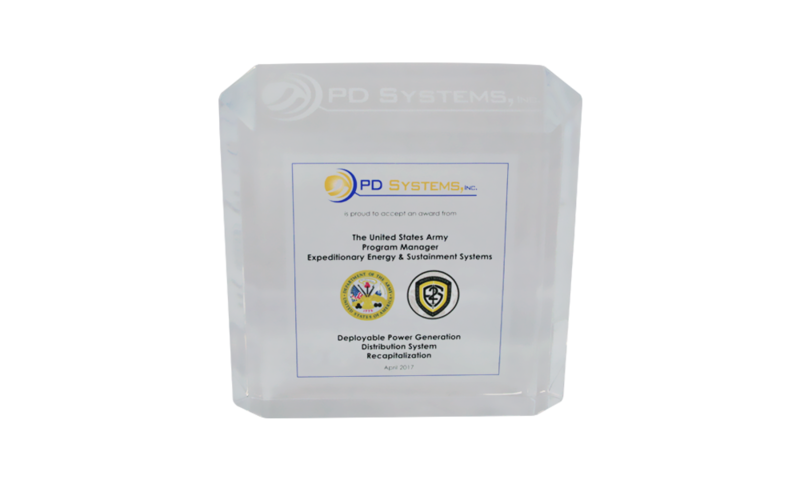 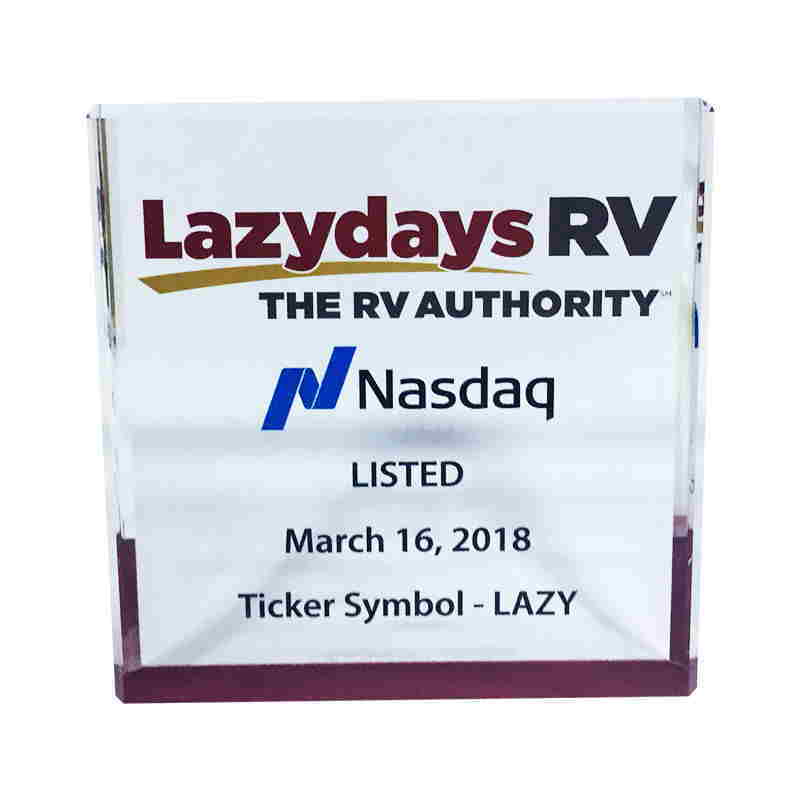 Custom, logo-shaped award recognizing exemplary service and commitment. 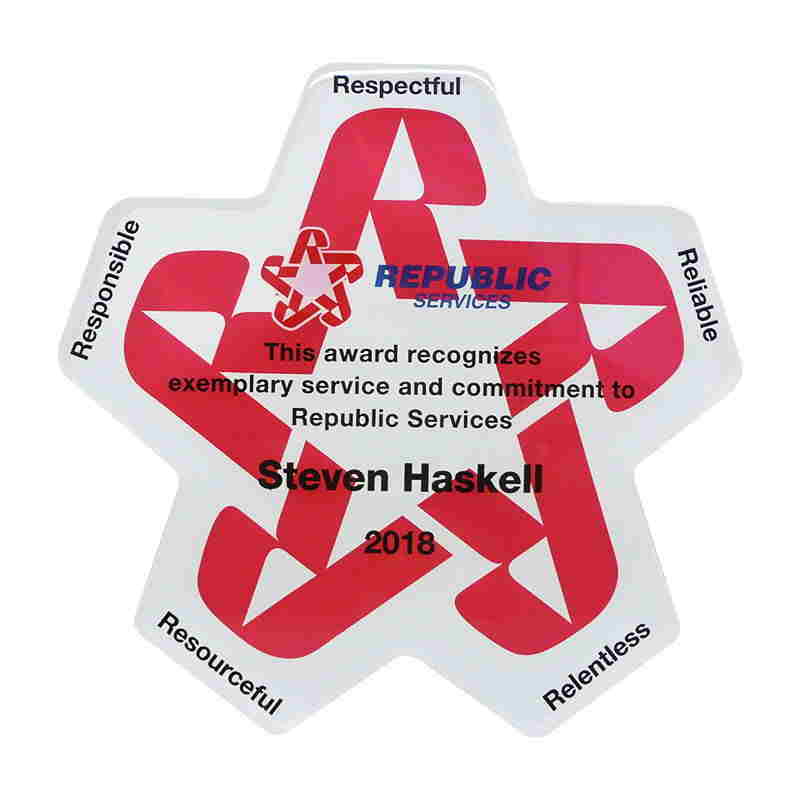 The award was presented by Republic Services, a Phoenix-based waste management and recycling firm. 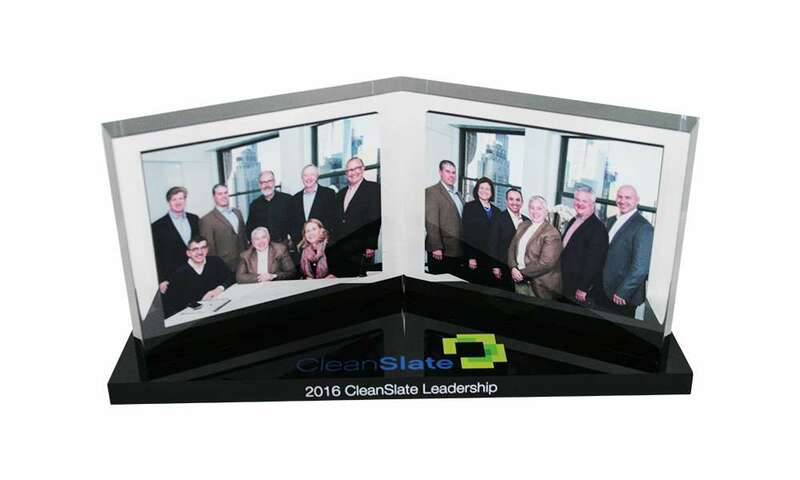 Custom acrylic recognizing the leadership of CleanSlate. 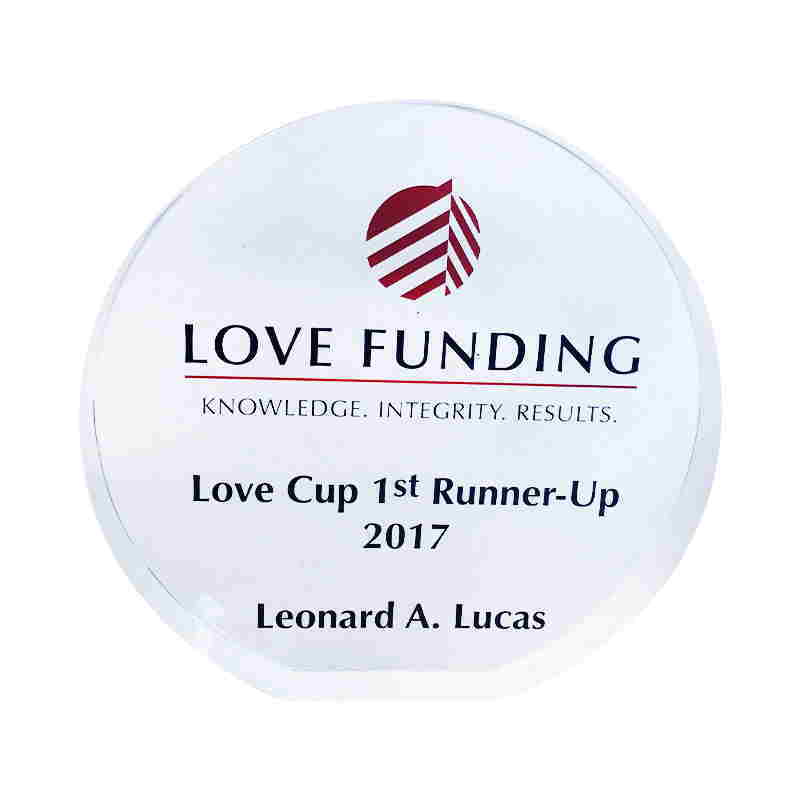 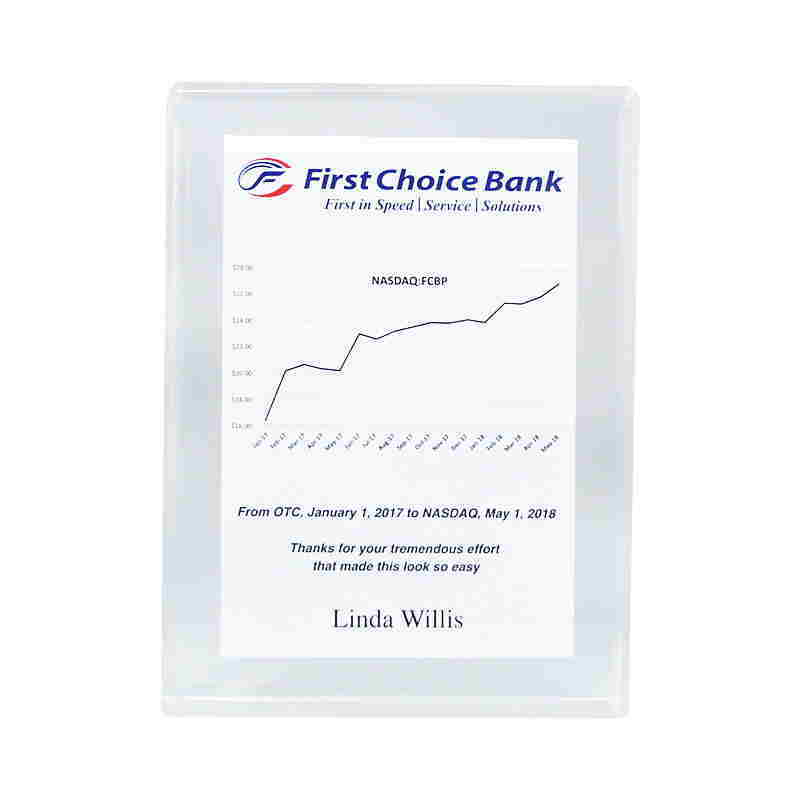 Custom crystal award recognizing top-producing originators at Love Funding, an HUD lender. 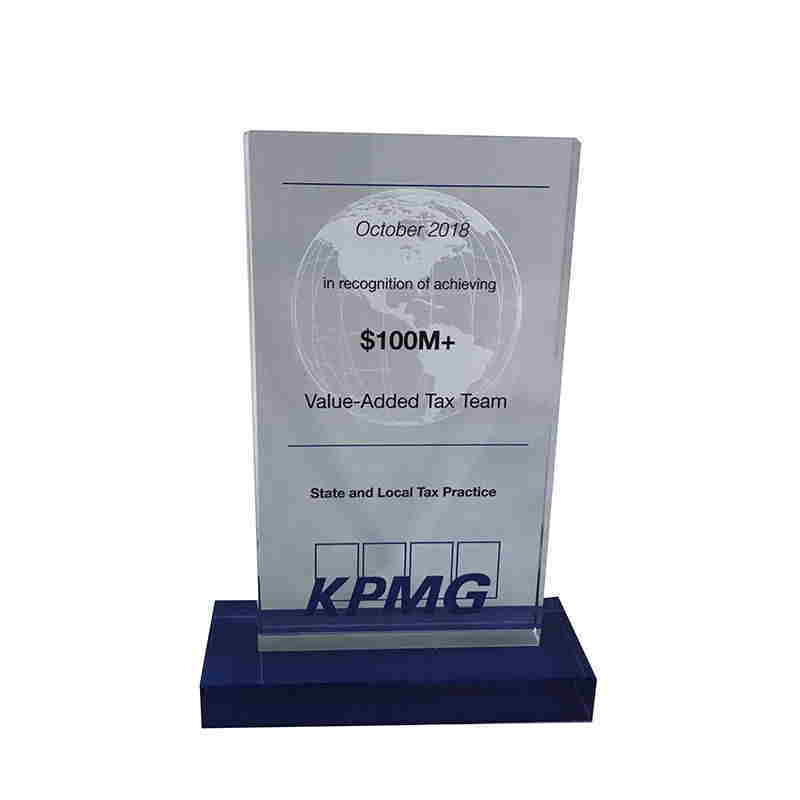 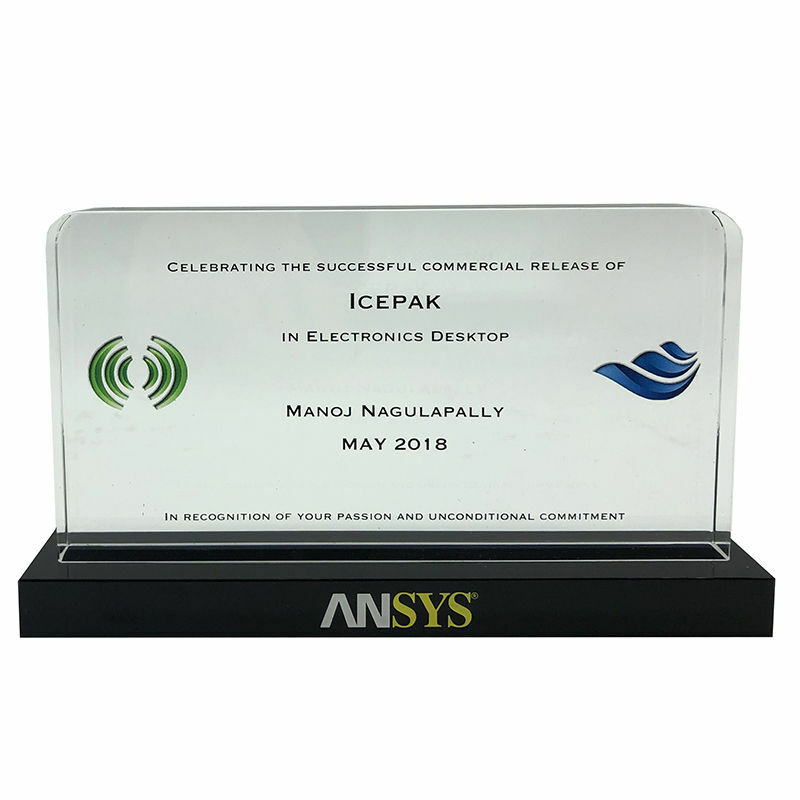 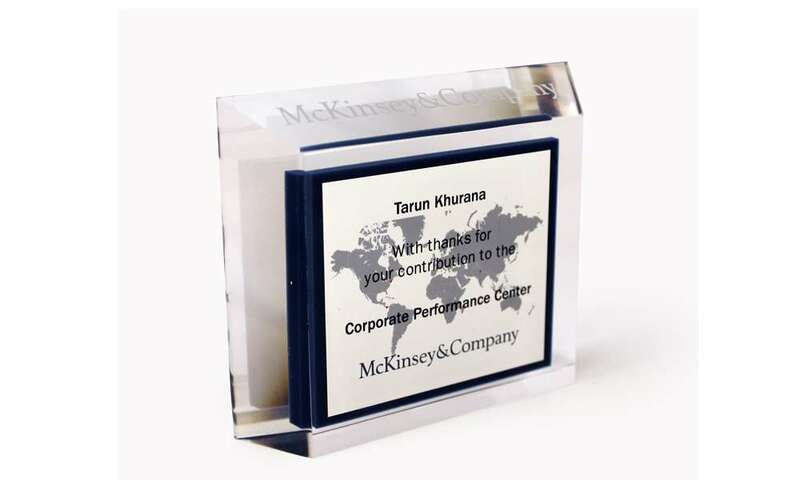 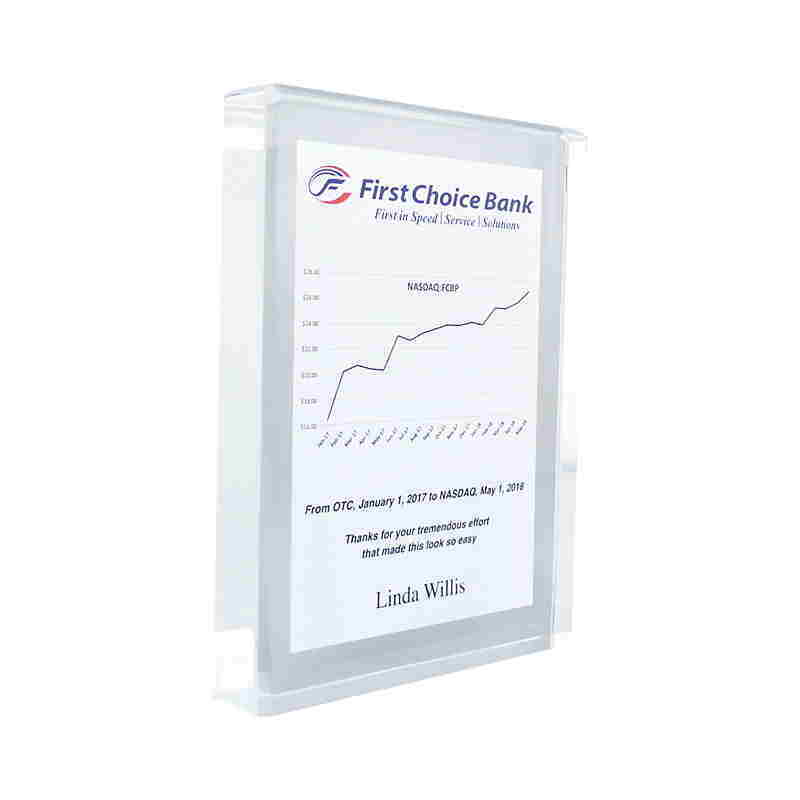 Custom acrylic award recognizing contributions to the McKinsey & Company Corporate Performance Center. 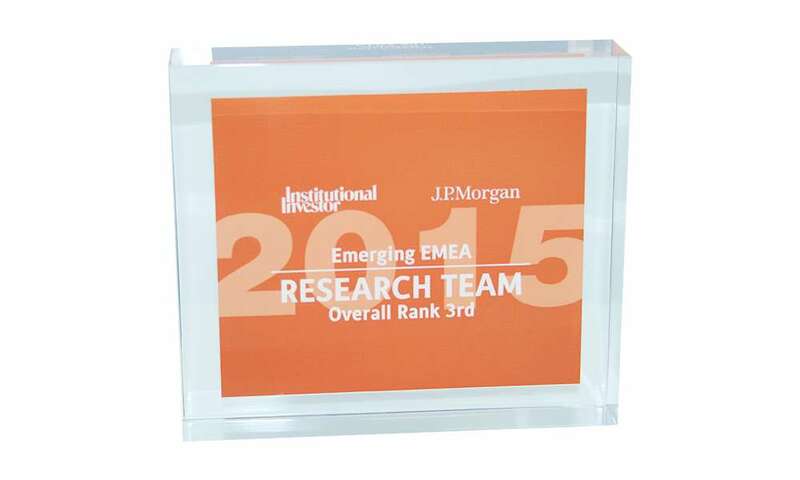 Custom acrylic team award recognizing the EMEA research team at J.P. Morgan. 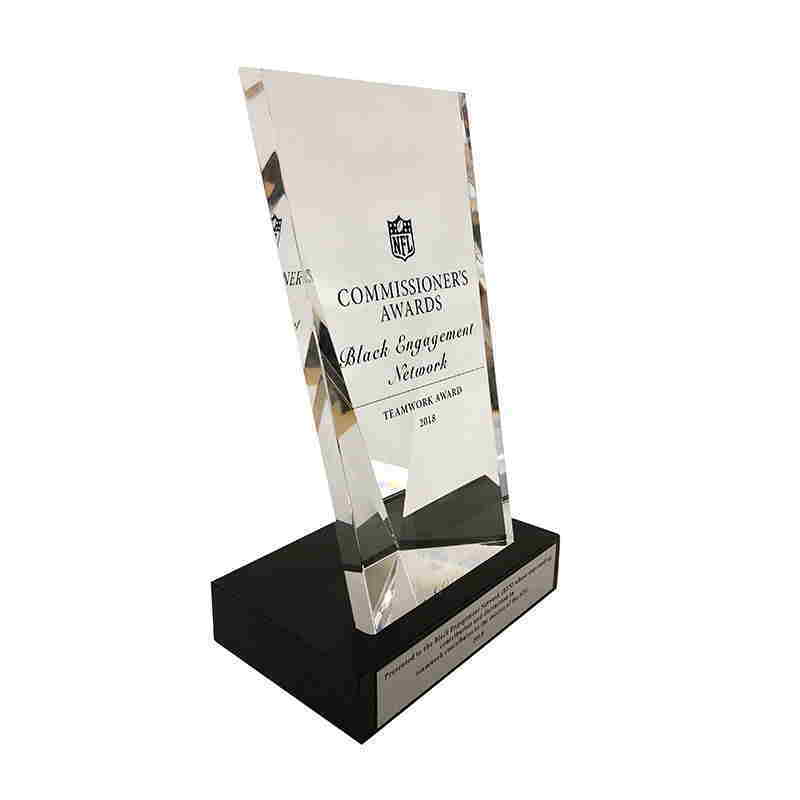 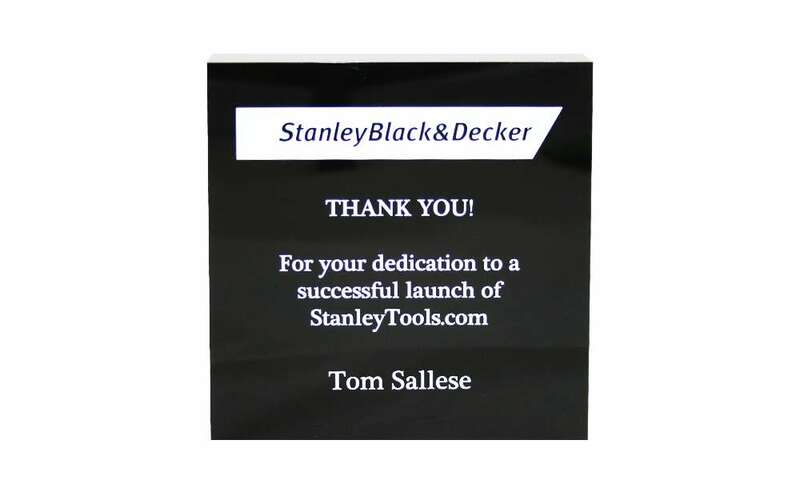 Custom acrylic award celebrating the launch of the StanleyTools.com website. 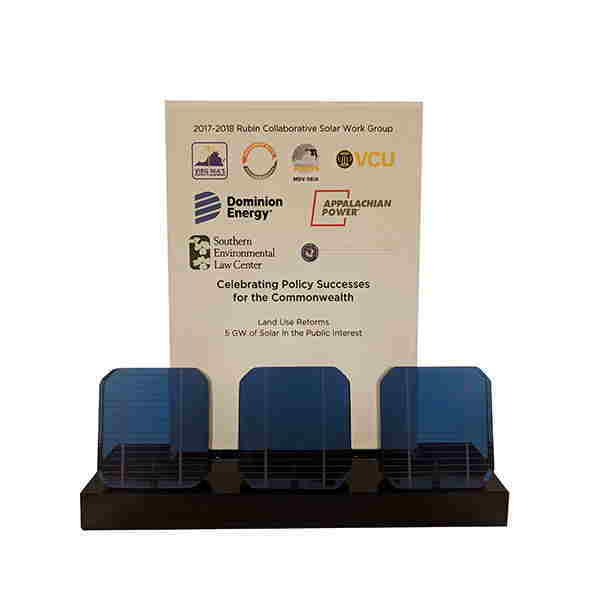 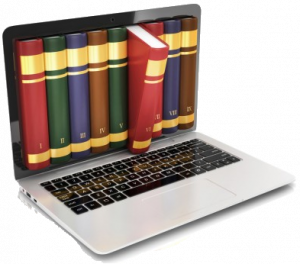 Considering awards for your team? 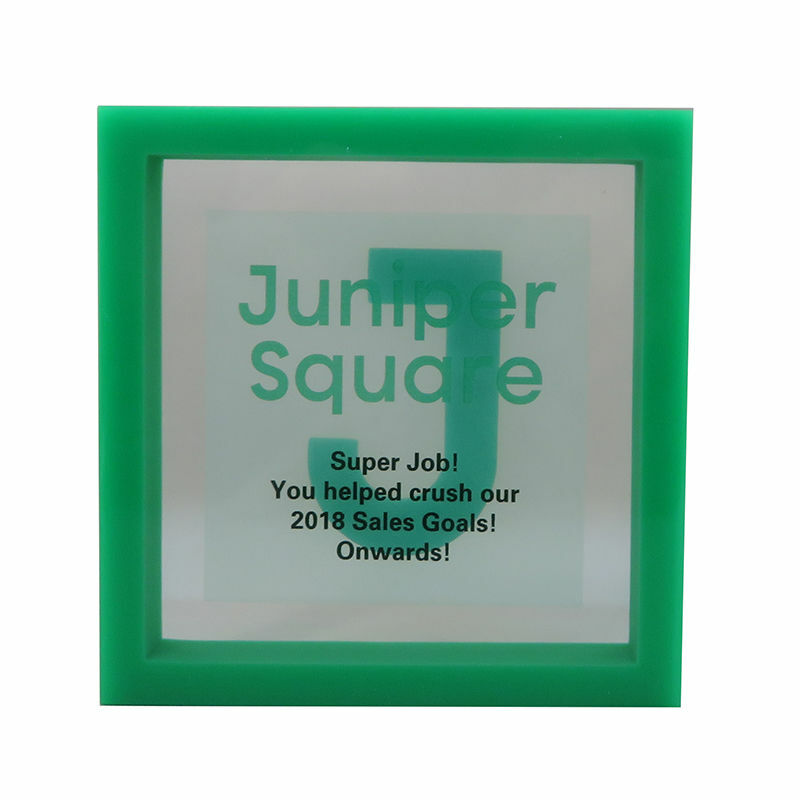 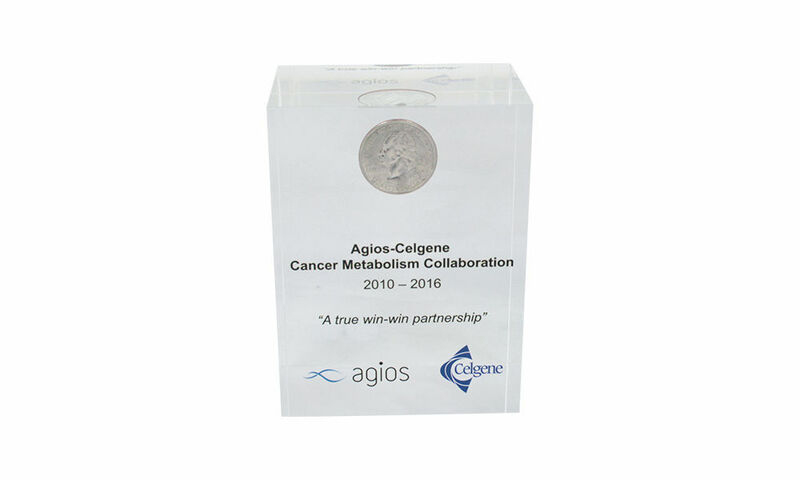 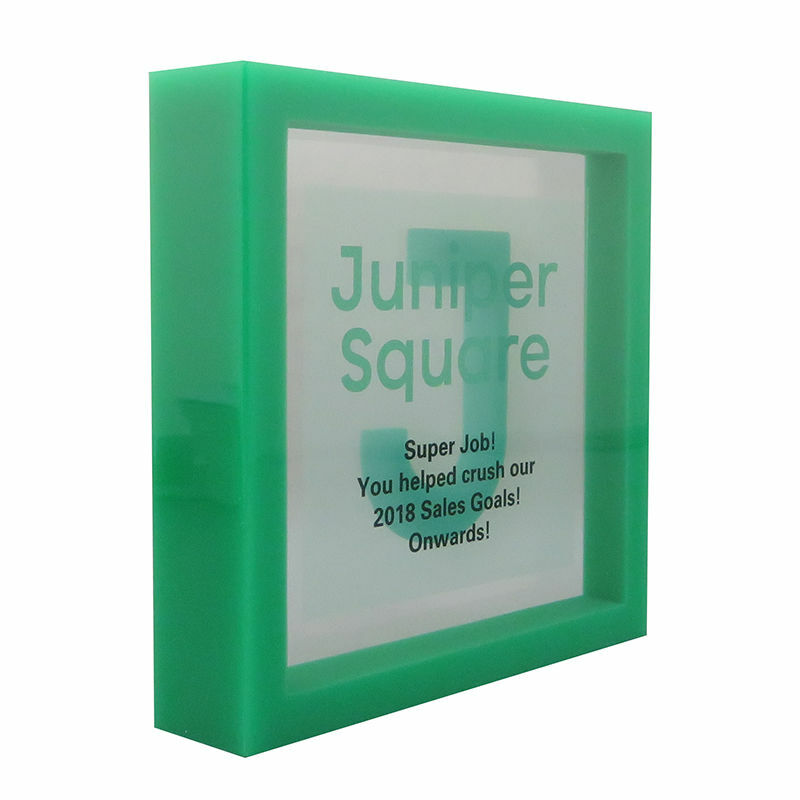 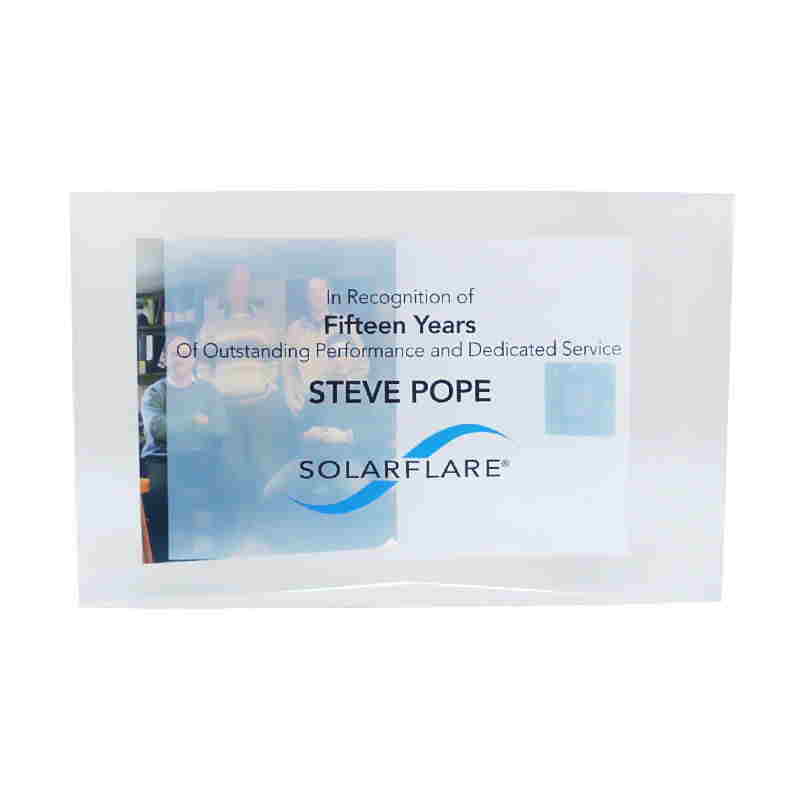 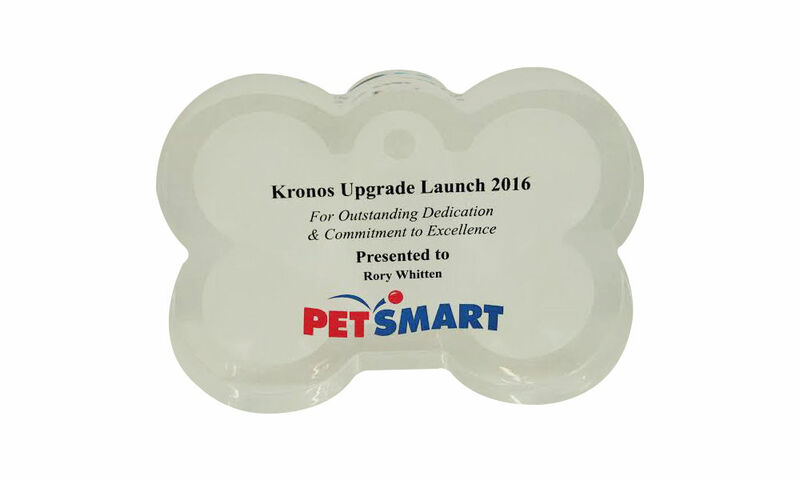 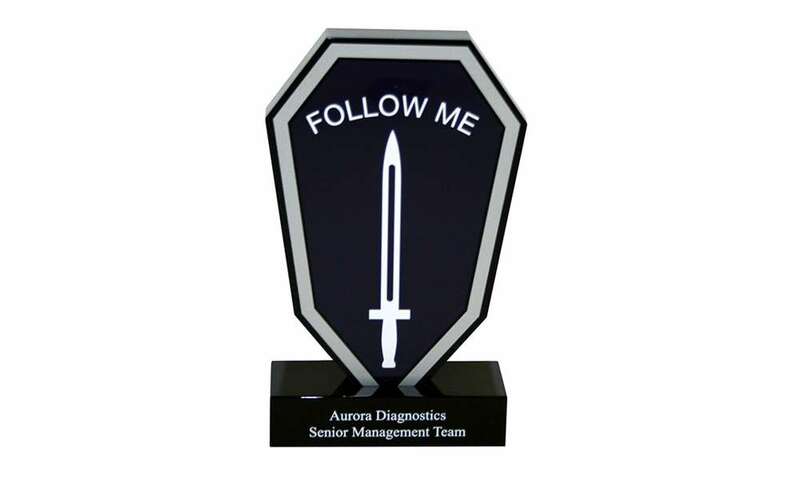 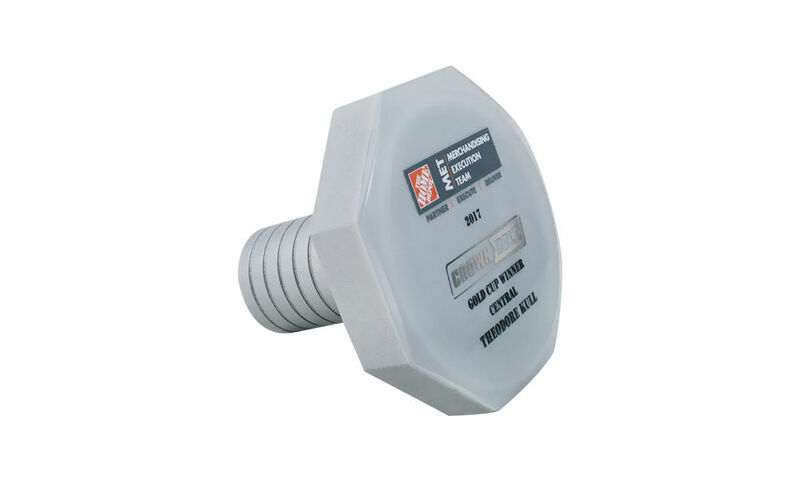 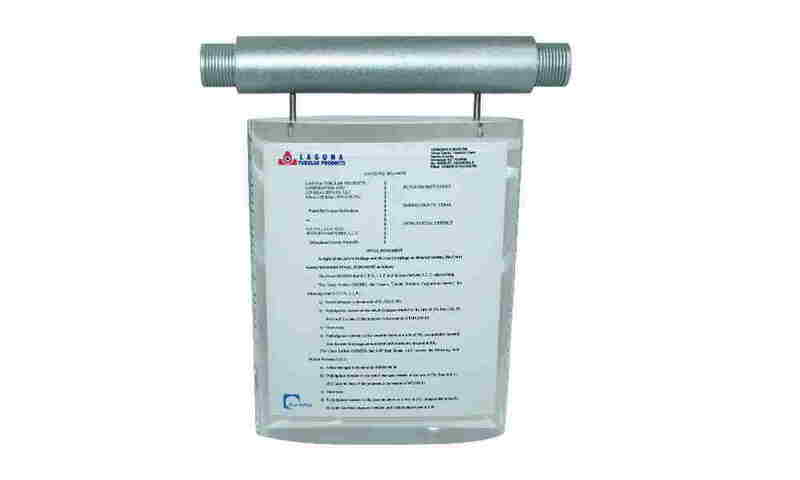 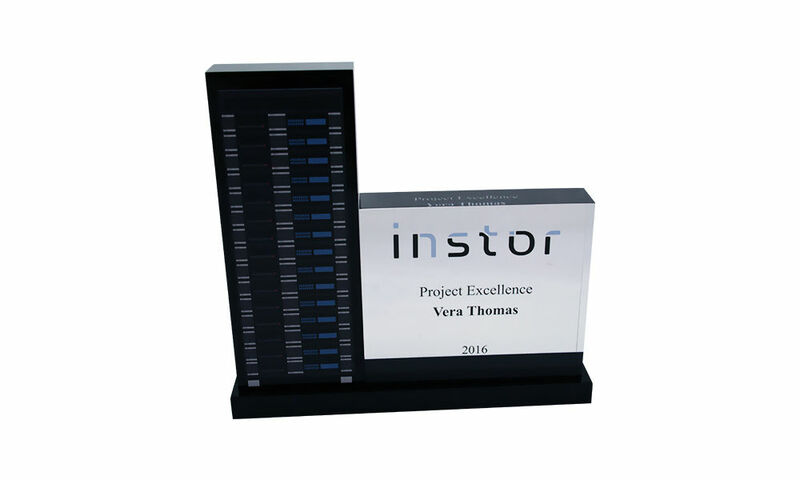 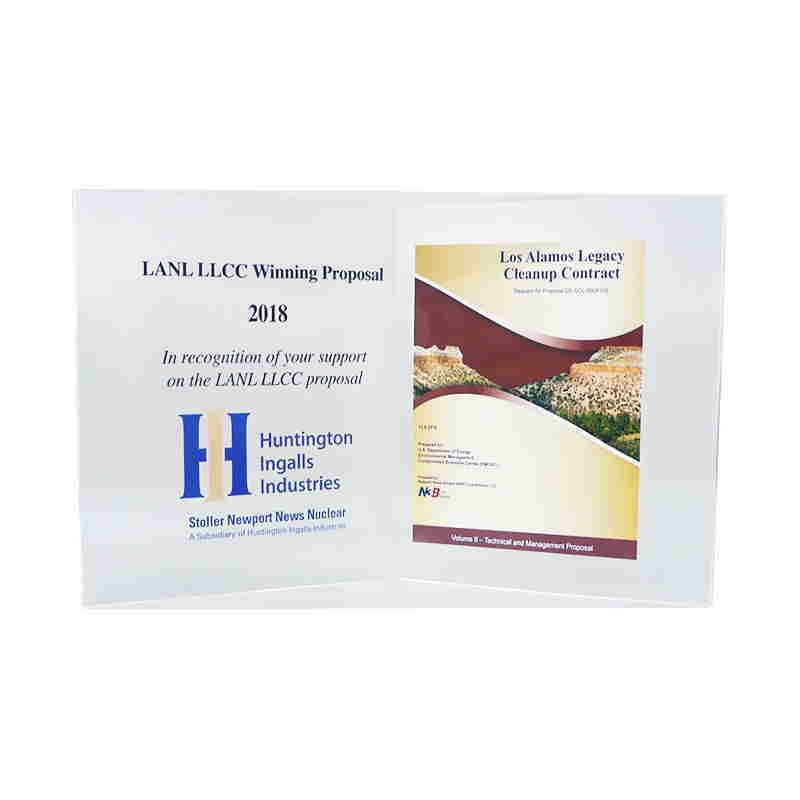 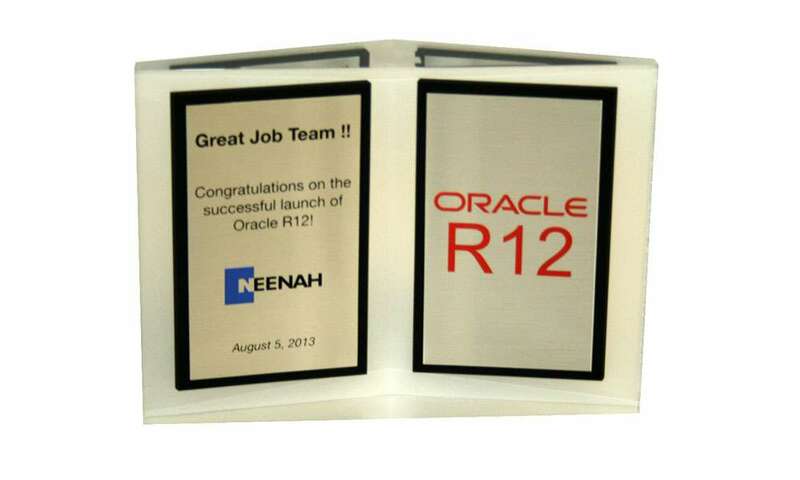 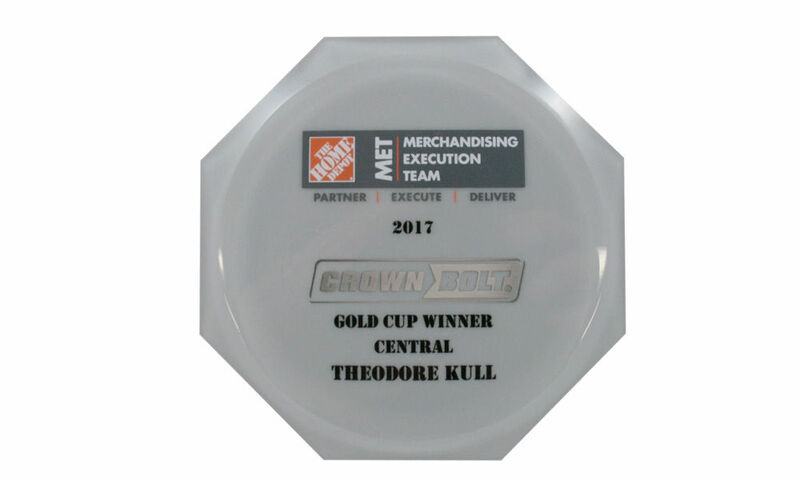 See some of the creative, customized team awards other organizations have designed with us. 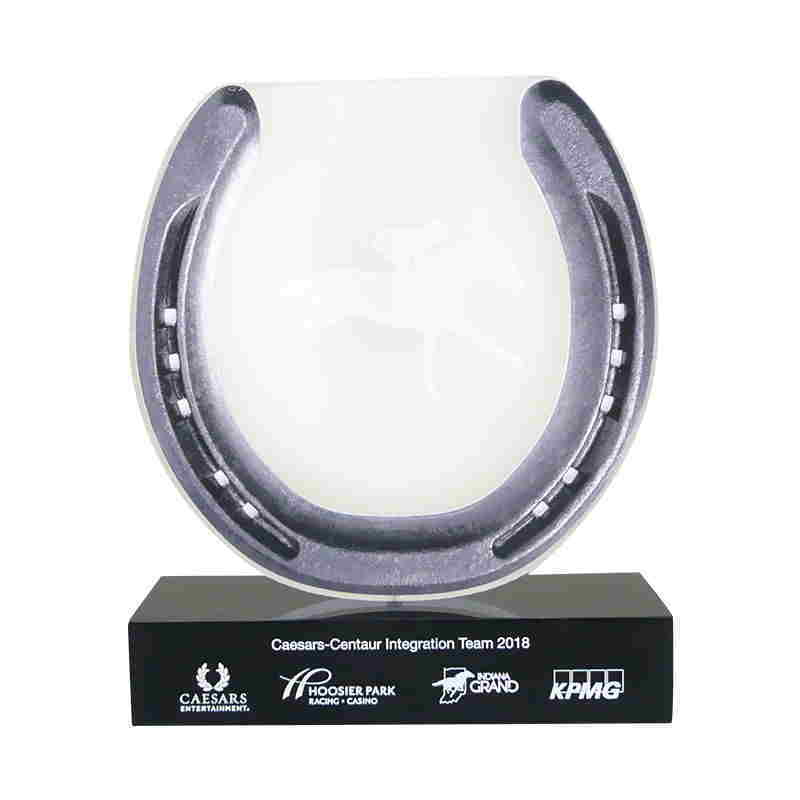 Get our free guide, “Team Award Ideas: 5 Ways to Recognize Success”.